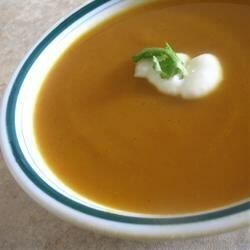 "A beautiful thick soup with bright orange colour and a hint of exotic spice. Perfect for autumn! Serve with a spoonful of plain yogurt and a sprig of fresh coriander for garnish." Melt the butter in a large saucepan over medium-high heat. Stir in onions, and cook until golden brown, 5 to 7 minutes. Season with cardamom, turmeric, ginger, pepper flakes, cinnamon, cayenne; cook until fragrant, about 1 minute. Pour in chicken broth and water; add sweet potatoes and carrots. Bring to a boil over high heat, then reduce heat to medium-low, cover, and simmer until the vegetables are tender, 25 to 30 minutes. Remove from heat, and puree in batches until smooth. Not bad but not thrilled. Weird because we like all the spices listed but they just didn't seem to blend well.